OTI is a modern cat bed. Cover material 100% cotton, stiffened frame 100% cardboard. Filling: synthetic soft fiber. Cover can be removed and washed. Dimensions in cm (width x height): 51.5 x 30. Weight: 3.4 kg. Made in POLAND. so it is worth providing them with a comfortable bed. hang over the ground like a hammock. OTI is 30cm high not without a reason - cats prefer to watch everything from above. so cats can feel comfortable and safe. 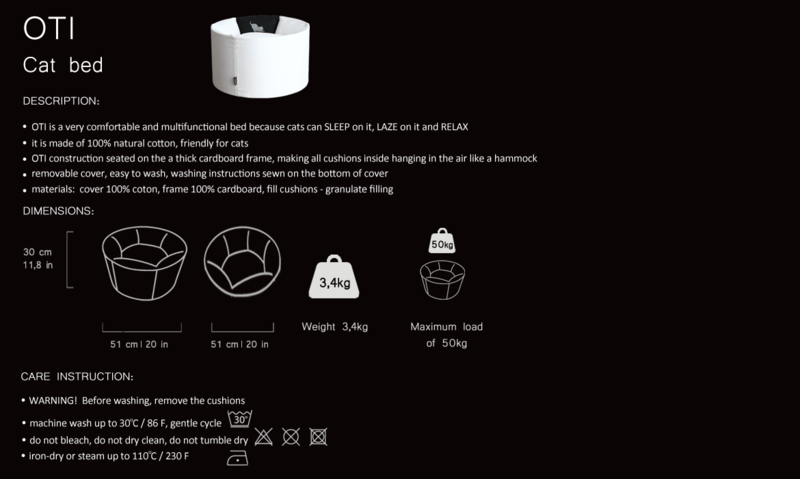 OTI oval shape was inspired by the shape of how our cats curl up while sleeping. even the most extremely twisted positions. OTI fits perfectly within any fashionable interior - we took care of it. with the best aesthetic experience of their owners. that keep the pillows above the ground. That is why OTI always looks and works perfectly. - the cover material is 100% natural cotton.